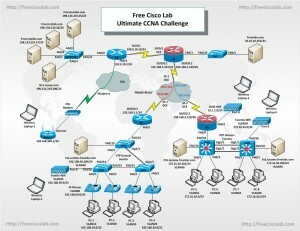 In this Free CCNA Lab challenge you will use Packet Tracer to configuring a small company with two sites Seattle and Tacoma, these sites are connected to the internet and their local intranet domain via a frame relay WAN. There is also a remote home office that connects to the internet and the company intranet via a DSL connection to their local ISP. Configure multiple VLANs in each VTP domain. Configure VoIP in one of the VTP domains. Configure STP for Seattle VTP domain. Assign all IP addresses using DHCP. Configure frame relay to connect all the sites. Configure NAT to connect the company to the internet. Configure wireless access to each site. Configure a wireless DMZ zone to allow internet access. Configure ACLs to control access to resources. Configure DSL remote access for the home office. The ISP router and internet DNS server are already configured. There is also three web server’s freeciscolab.com, freeccnalab.com and freeccnplab.com configured as HTTP and Mail servers. There are two VTP domains in the network. Seattle domain comprises SW1, SW2 and SW3, which have VLANS 10, 20, 30, 40, 50, AND 60. The Tacoma domain comprises S4 and S5 which have VLANS 10, 20, 30, 40, and 50. Each of the VTP domains has PC1 and 3 are assigned to VLAN 10 while PC2 and 3 belong to VLAN 20. VLAN 30 is the management VLAN and the native VLAN. The local servers are assigned to VLAN 40, and wireless access is assigned to VLA 50. VLAN 60 in the Seattle VTP domain is dedicated for the VoIP Phones. Note: that the IP Phone have built in switch which directs the voice and data VLANs. DHCP is configured on R1 and R2 to assign IP addresses for the PCs in VLAN 10 and 20 and the wireless in VLAN 50 of both sites as well as the VoIP in VLAN 60 of the Seattle site. All wireless connection in the Seattle, Tacoma and Home Office sites need to be secured to prevent unauthorized access. A point-to-point hub and spoke Frame Relay network comprised of R1, R2, and R3 connects the Seattle and Tacoma site to the Data Center. In order for the hosts, servers to communicate over the WAN they will need a route to each other’s networks. Configure a dynamic routing protocol on the routers to insure connectivity. In order for the host computers to access the internet/intranet a default rout will be required as well as the address will need to be translated. Only hosts in VLAN 10 of Seattle will have access the VTY lines of the Data Center. Only hosts in VLAN 20 of Tacoma can access the ftp services of freelabs.com. The hosts in VLAN 10 of Seattle won’t be able to access the Internet. DMZ wireless access can only access the internet. Computers connected to the Home Office network need access to the web servers and the company intranet freelabs.com. All hosts can ping each other. All PCs and servers can ping each other and vice versa. All PCs can access the web servers in the internet and internal intranet. Only hosts in VLAN 10 of Seattle can access the vty lines of the Data Center. Hosts in VLAN 10 of Seattle cannot access the Internet. Only hosts in VLAN 20 of Tacoma can access the internal ftp server freelabs.com. Internet web servers and internal web server can be accessed from the Home office. Home Office can access the internet and the company intranet. All IP Phones can call any other phone.